Thread: 2017 Ninja 650 Clip-ons ? Any news when different bars may be available for the 2017. I'd really like something lower and with less sweep. Preferably adjustable. Currently thinking ok some Woodcraft 3" rise clip-ons mounted below the top triple using their riser spacer to clear the front mounted fork pinch bolt. Anyone see a problem with doing this? Any other options? Don't really want top mount as I'd have to slide the forks up and would prefer to keep them where they are. I’m about to buy the 2018 Krt and I’ve found every thing I could possibly want to do to this bike BUT the handlebars. I was considering doing the same thing. Let me know if that works out for you. I want lower bars but I don’t want to hit the tank or front fairings. I'm interested in this too. I'm sure it's possible, I'm just not willing to play the ebay-roulette until I know a model is compatible for sure. I'd appreciate the adjust-ability, but I'm not that desperate for the feature. Look up "laverda adjustable bars"
I have them and I tried them on my '07 Ninja but the fairing and the tank really limit the amount of adjust-ability available on that bike. They work great on UJMs. You are not that far from me. Maybe we could get together one saturday and we could see how they would mount up on your bike. In my opinion, I wouldn't bother. I could see why you would be looking for a sportier handle bar only if you had a 2016 Ninja 650. 2017 Ninja 650's handle bar position has been lowered by 42mm and moved 25mm forward. Anyways, I picked the 2017 Ninja 650 because I felt the 2016 Ninja 650 was not sporty enough despite being on clearance sale, I didn't want one. Also the Z650 is virtually identical to Ninja 650 but has higher handle bar, so the Ninja 650's bars a bit lowered anyways. But those statements above do not answer your question, so here goes. I do not think Woodcraft clipons with riser would work. You know how they get mounted right? The bars will be moved forward and lowered. The Ninja 400 handle bar might work, and because of its flar profile, you would not have to raise the fork as much, but as you can see, it requires additional bolt to make it stable... I don't know if you can drill a hole or if it's possible to come up with another solution. I have a 2012 and would love to put the 2017 bars on mind. Would that work? Edit: Looks like Timpo may be right (read next post). I was only thinking about changing the bar itself. You'd have to swap the whole assembly, which would be pretty expensive if undamaged, but it might be possible. I'd like to think the spacing is the name, and it should be, but you never know. If this really, really interests you, it might be worth checking out. Last edited by MillennialNinja; 02-18-18 at 10:50 AM. As you can see, the 2016 and 2017 Ninja 650 handlebars are both mounted by two bolts. They have very similar structure and mounting position is very similar, it might be identical. 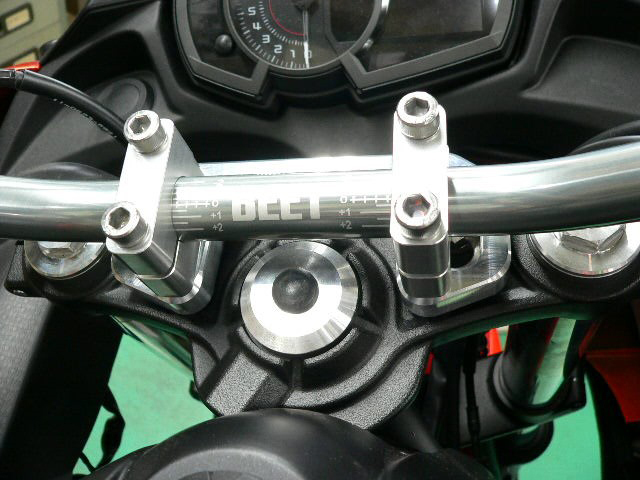 Just by looking at it, they do have identical handlebar damper (part #92161) which tells me that the diameter of mounting hole is probably identical. Judging by the diagram, the mounting positing might be identical too. If not, you might have to purchase the top triple tree holder so that you can mount the 2017 handle bar if it fits. 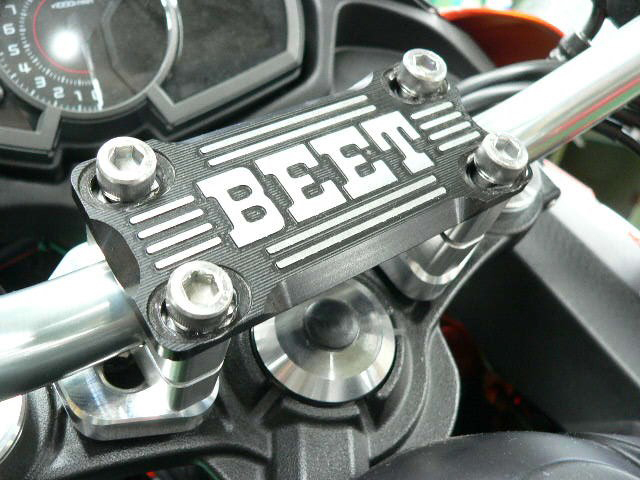 Sorry for multiple posts, but I'm just posting this is make a point..
Due to high demand, Beet just introduced the bar riser. As you know, the 2017 Ninja 650's handle bar has been lowered significantly compare to the previous generations. Which is not everyone's cup of tea. Anyways, I don't think lowering the 2017 handle bar even more does not make much sense, I know it's each to their own, but it is NOT a ZX-6R. Haha And to think that while I was riding earlier today I was thinking "You know, I wouldn't mind a less upright position one bit...". Oh well. - Check out my 2017 Ninja 650's Mods & Upgrades! - If you're looking for some new projects, I've got a few interesting motorcycle DIYs. If I wanted supersport position, my god I would have an R1 in a heartbeat (for the cross plane crank, love that engine sound). Thanks Timpo, I may actually get that riser. Haven't been on here for a while. Want to respond to some of the comments. First I have long arms and the stock bars have too much sweep for me putting my wrists in a painful position. There is no way at all to adjust the stock bars. What I would love to have is a bar that is about an inch farther forward at the endsby taking out sweep to accomplish that. I would also like a bar that is 1-1.5 inches lower at the ends by way of having a downward angle, less flat bar. This would put me in much better position for aggressive cornering In twisties. I love the rest of the bike, I neither want or need a ZX6R. I would just like some adjustability to accommodate the ergonomics I am looking for. For much the same reason I don't like the sportbars or the woodcraft version either. Does anyone actually import that BEET riser into the USA? All the pages are in Japanese. I know https://www.samurider.com/ has really good reputation with their customer service. You might want to contact them and see if they're able to get it? I heard really good things about them. 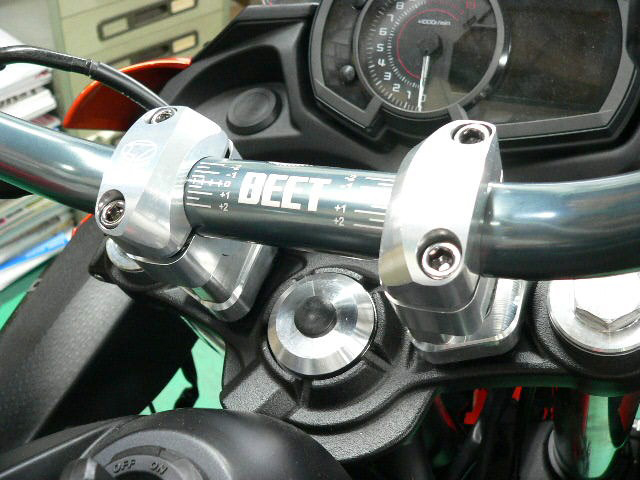 Also Webike might be able to get it, they're pretty big, the Revzilla of Japan.